Saturday, July 26, 2014, did not start out quite like any other day…and it certainly did not end like one. I went to work as usual, but that is where anything normal ceased. The parking garage at work was closed for maintenance so I had to enter the building a different way, and as I did, I found a very cool black and white feather, one I never would have seen had I entered the regular way. 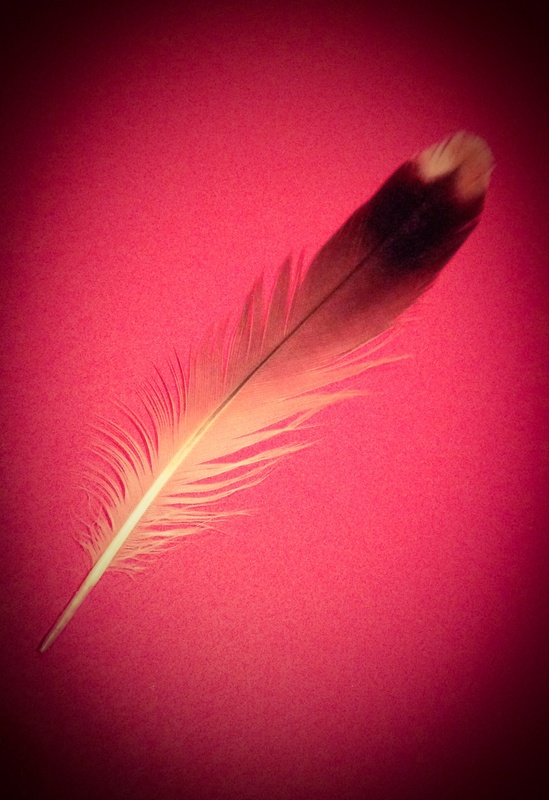 Normally a feather brings me joy, but this one made my heart and my stomach trade places. My friend Lola had recently (and reluctantly) taken another medical leave from work to try to gain some strength and, she hoped, begin a clinical trial for an experimental treatment for the lung cancer that had been diagnosed about 2 and 1/2 years ago. She had never smoked a day in her life, by the way. She underwent surgery, chemo, side effects, radiation and more side effects and acceleration of the disease. Then she changed doctors and treatment centers and was placed on a medication that gave her a new lease on life for a number of months. In her words, it bought her some time. But eventually that treatment became ineffective as well, and her doctors placed her at the head of the list for a clinical trial. But paperwork took forever and delays kept happening, and with no treatment of any kind to slow the disease process, she became much sicker, much quicker, so she arranged to take time off from work. When she took this last leave, I gave her a speech. “I know your mother loves you, but she lives in Atlanta. And I know Kevin (her fiance’) loves you, but he lives in Los Angeles. I love you and I am here, and I could get to you quickly if you needed me to. So I think the time has come for me to check in with you every day, just to see if you’re doing OK, if you need anything from the store, that kind of thing.” And she agreed to let me do it. She was very short of breath so our check-ins were text messages. It was a lot less taxing for her than trying to carry on a conversation. I am grateful for those messages now, to be able to look back at our communications that way. Lola was my coworker first, but over time we became friends. She used to leave fortune cookies in my work mailbox because she knew I got a kick out of the fortunes. I collected dozens of them thinking I would use them in a craft project. That may still happen at some point. We talked about typical girly stuff, clothes and shoes and makeup. She was one of the most stylish people I ever knew. I used to heckle her about her shoes, saying, “If I tried to walk in those heels I’d fall and break every bone in my body!” She’d just laugh and roll her eyes. 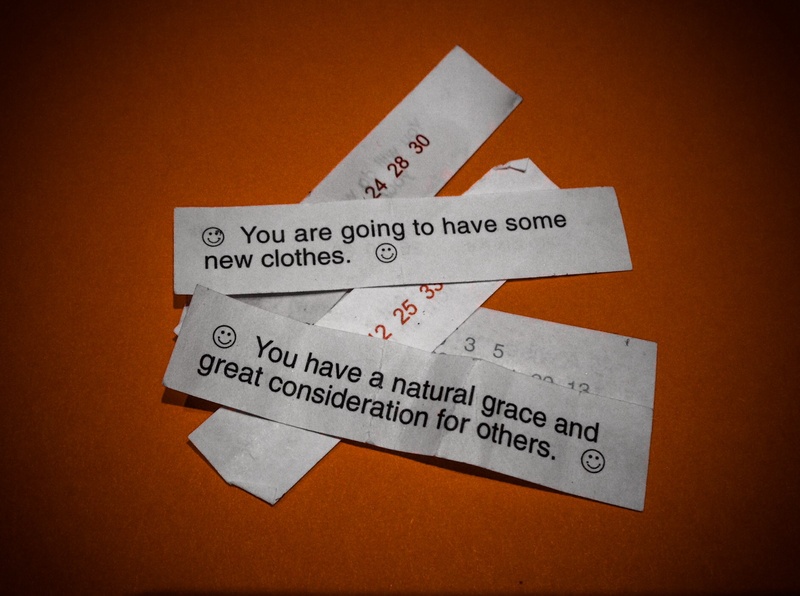 The fortunes below speak volumes about who she was. She and I were as different as night and day, physically. Lola was a tiny slip of a thing, an athlete (some of her speed records in track and field are still standing), very health-conscious her whole life (except for her love affair with Ben and Jerry! ), with very dark African skin. I, on the other hand, had surgery to help me gain control of my health due to overweight issues and am the palest white-skinned person I’ve ever met. 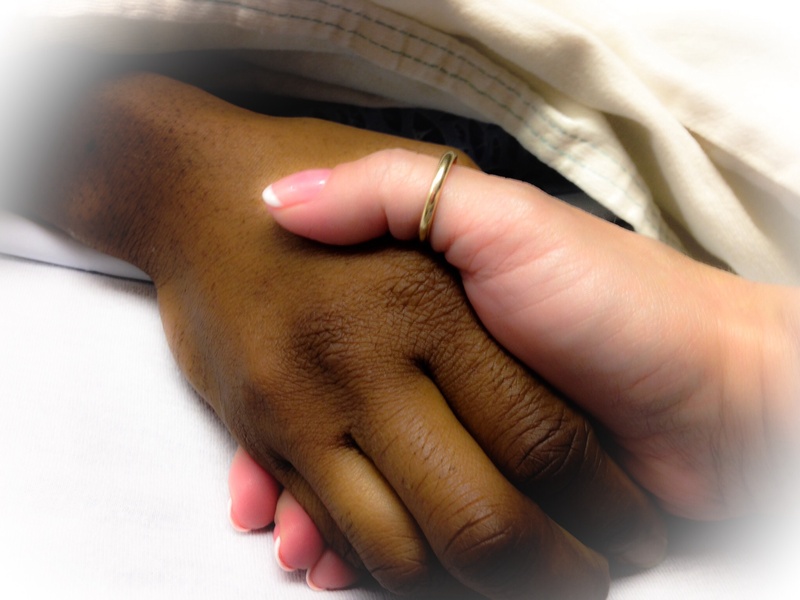 Her cancer surgery was just a few months before my weight loss surgery, and after we both got operated on and were recovering, many of our conversations started to center around our new health concerns. Calories were a big topic of conversation; my restrictions on them and how she could increase hers to build up her strength. Vitamins and supplements were also frequently discussed, with recommendations from my dietician and her naturopath. There were times when both of us found eating much more of a struggle than a pleasure. 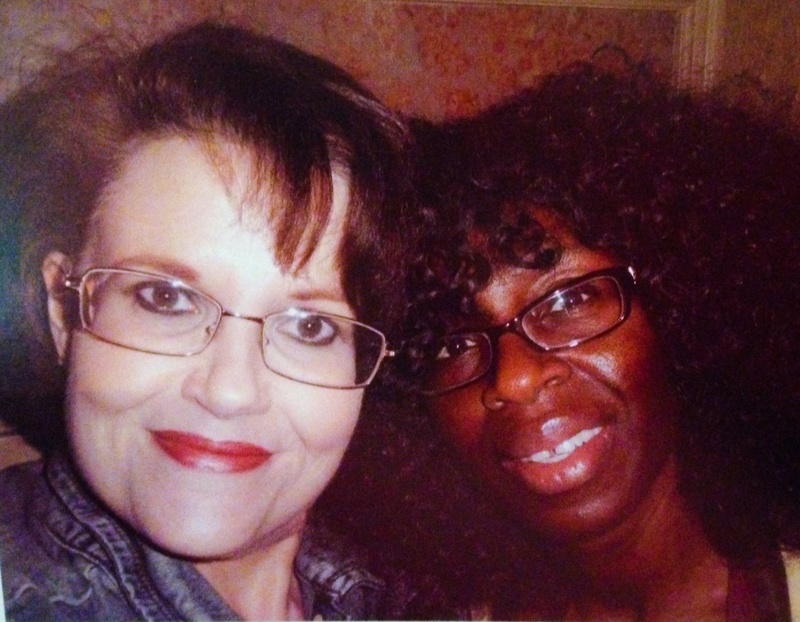 Side effects from her treatments and my rapid weight loss gave us more common ground as we both lost hair. And we both could appreciate the irony of all of this…how very different we were, how different our surgeries (and the reasons for them) were, and yet, here we were experiencing so much of the same stuff. We spoke about the deeper things of life, too. In all the time she was sick, never once did she express any self-pity. Not ONCE. She did express moments of confusion, as in, “Lung cancer, me? Really? !” Her biggest questions in all of it were, “What am I supposed to be learning from this? What am I supposed to gain from this experience and how am I to use that going forward?” She expressed great concern and compassion for people who have to deal with catastrophic illnesses like cancer without health insurance. She expressed gratitude that she was not worse off than she was, gratitude for her job and for her health coverage. Her biggest priorities were not worrying anyone, not being a burden and not leaving anyone at work holding the bag. She was incredibly strong, fiercely independent and intensely private. Many people at our work had no idea that she had cancer. Her death came as a shock to a lot of people. She tended to keep others at arm’s length. I will always be grateful that, for whatever reason, she let me into her world and confided in me. It was an honor to be able to provide what little practical help I was able to, and again, what she would allow. My last daily text check-in went unanswered for several hours, and I started to feel uneasy. I knew Kevin was staying with her, which helped me feel a bit more at ease, but I was anxious to hear back, so around midnight the night before she died, I messaged her again, apologizing for texting so late but that I was concerned whether she was OK. Kevin called me back a few minutes later to tell me that she had started coughing up blood and he had taken her to the hospital, where she was treated and admitted to critical care. I asked if they needed anything and he said no, they were OK for the time being. So I told him that I would see them the next day. I didn’t sleep. I got to work and found the feather. I called the hospital to learn the visitation times for the critical care unit, and the next one was at 12:30 pm, my lunchtime. I thought, OK, this is great, I’ll go then and check on them. When I arrived, I found her in her bed with a ventilator tube, but no ventilator attached. And again, my heart and stomach changed places as I realized, “Oh, dear God, she has died…” DIED. Kevin had arrived just minutes before I had and was in a consultation room with a nurse. I found them and we tried to listen to her explain what had happened…I caught some of it and Kevin caught some of it, but I don’t think either of us absorbed it all. Maybe it’s better that way. Some stuff we are better off not knowing. Lola died at 12:19 pm, just minutes before either of us got there. And I think that was meant to be. I know with certainty that she would never have wanted Kevin’s last image of her to be her moment of death. My biggest fear had been that she would die at home by herself and I prayed that would not happen. I am so grateful that God honored that prayer. I was able to sit with her for a bit, to say goodbye and tell her not to worry, that we would all be OK, in time. I hummed and held her hand and told her I loved her and I would miss her. She was as different from me as night from day, thin from fat, black from white. She was my friend. Her name was Lola. A wonderful tribute to your special friend who is smiling from her new place in heaven. My prayers are with you as you go through this difficult time. Thank you so much, Kurt. My prayers are with you as well.